We’re doing a Grease production at school in July some time. I am so nervous! I’m playing the part of Sandy, and as soon as I found out that I got the part I was soooooo happy! We have a 2 hour practice every Wednesday afternoon and have nearly blocked all the scenes, but none of us have learnt our lines! I am so excited but worried because there’s going to be 100 people or more, I better get practising! I try to go to the gym every other day at least, I have to burn off all that chocolate somehow! Roefield is a leisure centre in Clitheroe and has it’s own kids gym that I go to, it’s great, you can keep fit but in a fun way, They do an activity afternoon called ‘Time out’ where you can rock climb, go into the gym, dance and loads of other cool stuff! I’m trying to get more kids to go, If you’d like to join go to the Roefield website or, comment on this blog. 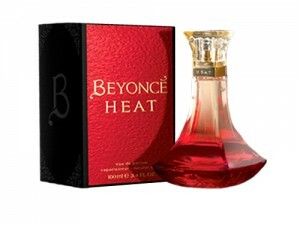 This perfume is definitely going on my Birthday List this year! It won best fragrance of the year in 2008, and has a wild strawberry and jasmine smell to it, it’s quite expensive but is definitely worth the price! 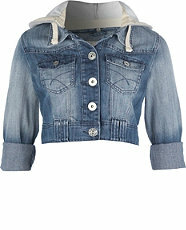 This hooded denim jacket would be perfect for going to the cinema or on a day out shopping, and is just £19.99 from New Look! It would go well with leggings and some white pumps maybe, please comment and give me your opinion. 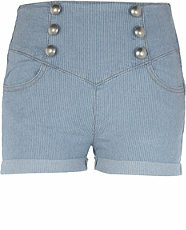 These stripy high waist shorts would go perfectly with some gold gladiator sandals or an over the shoulder bag for the summer, and are only £13.99 fom New Look! That sounds like a bargain price to me. 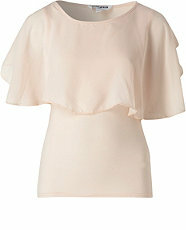 This Floaty Cape top is only £11.99 from New Look , sounds good to me!